Jammu has an impressive array of temples, three hundred and ten of them having been built within the municipal limits of this holy city of 90 square kms. only. This vast sanctuary of temples attracts pilgrims in large numbers when they flock here, at the foot of the Shivalik hills, to start their upward climb to the famous temple of Vaishno Devi, MRS. KAUSHLA, a Ph. D. research scholar, along with MR. RAVINDER SINGH, trace for our readers the beginnings of this holy city, which came to be founded by chance and also the fact of how different temples came to be raised here from time to time. Tucked away in the foothills of the Himalyas, with the picturesque river Tawi flowing along side, stands the land that Raja Jambu Lochan discovered one day while he was hunting in these areas. Legend has it that he suddenly came upon a clearing where he saw a sight that left him speechless. 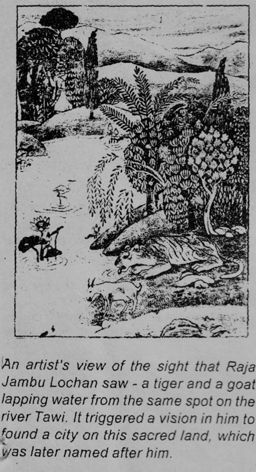 A tiger and a goat stood side by side drinking water from the same place on the bank of Tawi river. He was so struck by this unusual sight that he decided to build a city on this soil where no living creature seemed to bear any enmity towards the other. 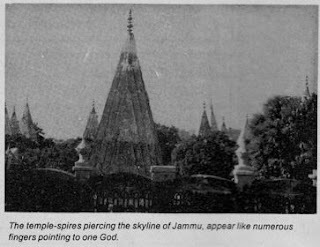 Today, as if in testimony of that purity and sanctity, the city of Jammu is popularly known as the 'City of Temples'. Innumerable temples and shrines with glittering spires soar into the sky like so many caretakers of the city, creating the ambience of a truly holy place. The entire Jammu City abounds in the religious wealth in the form of temples dedicated to various sects of Hinduism. Gulabnama and Raj Darshani, the two principle chronicles related to Jammu, assert that the Jammu kingdom was founded by Raja Jambu Lochan nearly 3000 years ago. Thus, the town of Jammu has got its name from Jambu Lochan which he is said to have founded as the administrative headquarters of his principality. The Dogras of Jammu by nature have always been honest, brave and religious people, most of them being worshippers of Shiv as well as Shakti. Maharaja Gulab Singh and Ranbir Singh were very religious persons and therefore constructed many temples of Shiva, Vishnu, Raghunath and other shrines in Jammu and Kasnmir. The tradition set by these rulers was followed by some subjects also. Hence with the passage of time, Jammu city came to be dotted with numerous big and small temples to such an extent that like Kashi and Ayodhaya, the Jammu city has.also come to earn the appellation of the 'City of Temples'. A beautiful temple town approximately of 90 sq. kmts. Jammu is inhabited by the people of various castes, creeds and religious groups. ln spite of its heterogeneous social and cultural agglomeration there is a great unity in its diversity. This temple town nestling at the foothills of the Himalayas is adorned by the beautiful, brave, courageous and hardworking people having a deep faith in religion and in the existence of supernatural powers. lts unique composition. location and character all make it a rich cultural centre also. Amongst he temples in the city, the Raghunath Mandir takes a place of pride for being situated right in the heart of Jammu. lt was constructed in 1 857 AD and has the largest cluster of temples in north lndia. The inner sanctums of the temples contain some gigantic images of gods and goddesses and numerous Shiv Lingams. lt contains almost the entire pantheon, of gods and goddesses, which makes it a rare sight to see. The famous temple of 'Bawey Wali Mata' is inside the Bahu Fort, where every Tuesday and Sunday, pilgrims throng in large numbers and jostle with each other for their turn to worship the Goddess. On the hill-op opposite the Bahu Fort, is a lonely spot over looking the river Tawi, where a temple dedicated to Mahamaya has been constructed. The Pirkho cave temple overlooking the Tawi river, the Panch Bakhtar temple and Ranbireshwar are the other well-known Shiva temples in Jammu. Each has its own legend, its particular devo_ tees and specific days of worship. ln Ranbireshwar temple there are 12 Shiva 'Lingams, of crystal 12 inches to 18 inches in height and the galleries of thousands of 'Saligrams' are placed on stone slabs. It is said that 'Bawey Wali Mata' is the presiding deity of Jammu who protects its people from mishap and evil spirits. People visit this temple trusting that their prayer and worship in th6 temple would lead to the fulfillment of their desires. temples are constructed by the local people and are dedicated to Mahalaxmi, Raghunathji-Gandharvji, Hanuman, Narayan, Shiv and Shakti, Radha Krishan and a host of deities. There are 310 within the municipal limits of Jammu city. The temple spires piercing the skyline of Jammu, appear like numerous fingers pointing to one God. An artist's view of the sight that Raja Jambu Lochan saw a tiger and a giat lapping water from the same spot on the river Tawi. lt triggered a vision in him to found a city on this sacred land, which was later named after him.